I have been following a popular workout program and nutrition guide so that I could be bikini ready for an overdue girl’s weekend to Charleston. The guide suggested a Mango Hawaiian chicken dish but I couldn’t find the exact recipe. My amazing accountability partner and best buddy sent me a similar recipe (check it out here). I had my heart set to make this for dinner, but by this time it was 3:30pm and I was missing a few of the fresh ingredients. Which means I had to do what I do best, improvise! Don’t get me wrong, I prefer fresh products but when dinner is due in three hours and your toddler is currently napping, you do what you have to do. First, I doubled the recipe so that it was “family-size” and used four pieces of thin skinless chicken breast. Preheated the oven for 350˚F. 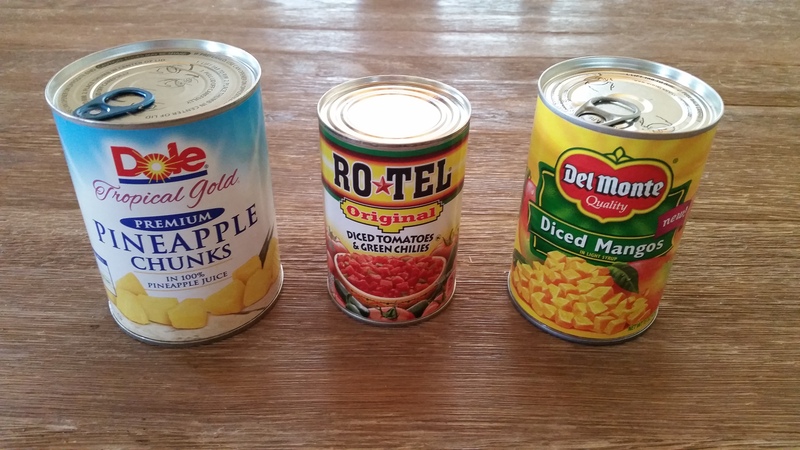 I didn’t have a red bell pepper, jalapeno pepper, or red onion handy but I did have a 10oz can of Rotel (mild) in the pantry. I drained the can, and rinsed it with water to get rid of as much excess sodium as possible. I placed the drained contents into a mixing bowl and added the cumin. I also didn’t have fresh pineapple or orange juice. Back to the pantry and I found a 20 oz. can of pineapple chunks. I drained the juice into a mixing cup and poured ¾ of the pineapples into the mixing bowl (I did dice the pineapple a little smaller). Then I poured ¼ cup of the pineapple juice into the salsa mix. Of course I did not have a mango sitting around either. Guess what, Del Monte now has diced mango canned! Guess what else; I had a can in the pantry! I used 2/3 of the canned mango and a ¼ cup of the mango juice for the salsa too. I stirred the salsa and sat it aside while I placed the chicken into a casserole dish. I spooned the salsa over the chicken. I loosely topped the casserole dish with aluminum foil and put it in the oven. I set the timer for 30 minutes and then took my wild toddler outside to play. By the time I came back in the dish had been in the oven for about 35 minutes. It came out perfect! To keep this on the healthy side of things I served my chicken over a bed of spinach leaves. I would imagine it would also pair well with rice, quinoa or couscous. Next time I make this dish I’m going to plan ahead, and can get fresh ingredients when I go shopping, so expect an update on this recipe soon. Happy healthy cooking everyone! Bake for 30-35 minutes, or until chicken is done and juices run clear.